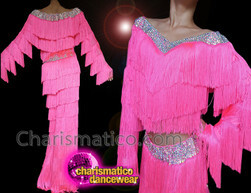 This is a dress that is ideal if you want to grad the spotlight and leave a lasting impression on the audience minds. The shiny yellow color of this fringe pant is enough to rightly appeal to your audience as a performer. The fringes add a flair to this costume perfectly.